"Ah, Ravel's Bolero. And who wrote that?" Walt Disney pioneered the marriage of classical music and animation first in his Silly Symphonies and then with his epochal Fantasia (1940). Though Fantasia had been intended to be a continuing series, Disney's company never got around to doing so until 1999. But in between, Italian animator Bruno Bozzetto took up the gauntlet and created a film that at times even surpasses Disney's classic. Six classical works are used by Bozzetto in his picture (named for the musical marking meaning "not too fast"), beginning with Debussy's Prelude to the Afternoon of a Faun. This wistful music is illustrated by the adventures of an aged satyr as he undergoes an extreme makeover in order to appeal to some nymphs. But the sexuality of the universe may hold a deeper metaphysical attraction for him. The short Slavonic Dance Nr. 7 by Antonin Dvorak is presented as a fable on conformity and the futile efforts of man to escape it. The pounding and incessant rhythms of Ravel's Bolero set the tone for the tale of evolution as life develops from a surprising source and tracks from amoeba to dinosaur to ape to man. Disney covered much of the same ground with the evolutionary ballet set to Stravinsky's Rite of Spring, but Bozzetto gives the theme a new twist by not just stopping with the end of the dinosaurs, but nonetheless ending up with some of the same terrifyingly destructive results. The Valse Triste of Sibelius is one of the most sublime pieces of programmatic music ever written, although a slightly different programme is followed here. A bedragged cat wanders into the bombed-out ruins of its home and fantasizes about how life used to be, coming down to earth with a heartbreaking thud. The first movement of Vivaldi's Concerto in C, PV 74 (not, as is sometimes erroneously suggested, The Four Seasons) is the backdrop for the adventures of an industrious honeybee that runs afoul of an amorous couple. The demonic overtones of Kastchei's infernal dance from The Firebird by Igor Stravinsky provides an answer to the question of what would have happened had the serpent in the garden of Eden eaten the apple himself. The results are dark and bitterly comic. Faun is the weakest of the sextet, though even it has its very amusing moments. Bozzetto is always happy to illustrate a gag, and even the most serious segments have their entertainment value. Each segment has a quite different style from the very simple linework of Faun to the UPA-style renderings of the Vivaldi bee. The Bolero features a tremendous amount of detail, as well as fascinating interplay of light and color during the inexorable march forward. But certainly the most beautiful and haunting is the Sibelius, with its delicate coloring in the dream sequences alternating with the brutal and stark black-and-white reality segments. Though I've seen this seven or eight times, that poignant segment still moves me to uncontrollable tears every time. Where this picture really differs from Disney's work is in the live-action segments. In Fantasia, the serious classical scholar Deems Taylor, beloved from the Metropolitan Opera broadcasts, held forth on classical music and the instruments of the orchestra, which was the renowned Philadelphia Orchestra conducted by Leopold Stokowski. Here, the master of ceremonies (Maurizio Micheli) is a dimwitted and smarmy hack in a loudly-patterned suit and what appears to be an ill-fitting toupee. The conductor (Nestor Garay) is obese, crude, and smokes a massive cigar, bursting out in laughter at the end of the Dvorak and cursing the illustrator at the end of the Sibelius for making such sad cartoons. The orchestra is a random assortment of aged women, harridans and hags all of them, while the illustrator (frequent Bozzetto collaborator Maurizio Nichetti), first seen hanging from chains in a dungeon, gets distracted from his artwork by a scullery maid (Mirella Falco). This makes for a charming little mini-drama of its own. And if that doesn't do it for you, there's a guy in a gorilla suit too. The live-action segments bored me when I first saw this film 25 years ago, but I've found them much more entertaining this time around. That may be because the presentation on this disc includes the entire Italian cut of the film, about ten minutes longer than the US version. The added material is all in the live-action, not in the animation, but it allows the comic material time to develop and it works much better in this longer form. There is, however, a fair amount of sexuality present here so this really doesn't fit into the Kids category as Fantasia would. The humor, while sometimes slapstick, is generally more adult in nature. But it holds up quite well indeed. Image Transfer Review: The film is presented in 1.33:1 rather than the more common European 1.66:1 ratio; Home Vision assures us that this is the original ratio and I see no reason to doubt them; my admittedly vague recollection of seeing it back in the day is consistent with a full-frame presentation and I see no signs of cropping or pan-and-scanning in any event. The colors are excellent throughout, and there's very little dirt or damage visible onscreen. The primary issue that I have with the picture relates to significant aliasing, which sometimes makes the linework look poor. A bit higher bit rate (the transfer runs at 5 mbps) probably could have helped; this is a pretty crammed set that might have worked better as two discs rather than one. Black levels are excellent, as one would expect with animation. It's not bad but it could have been better. Audio Transfer Review: The Italian stereo track has a substantial amount of annoying hiss. At times, crackle can be heard on the audio track of the music that leads one to suspect it was taken from a vinyl disc rather than a master tape of some kind (the performances are all from major Deutsch Grammophon recording artists, including Herbert von Karajan). The stereo tracks provide for a decent soundfield though there's not very much clear directionality. Low bass is pretty much missing for the most part. The music is often shrill, and the Sibelius suffers from a good deal of distortion. Going back to DG's original tapes of these performance probably would have been worthwhile since I doubt that they sound as bad as they're rendered here. Extras Review: Home Vision provides some outstanding extras for this disc, which I'd frankly expected to come out barebones. The documentary The World of Bruno Bozzetto (42m:33s) covers his entire career, including the making of this film. 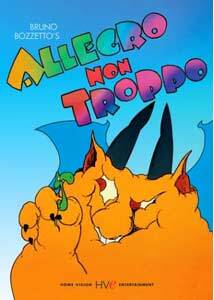 It's primarily made up of interviews with Bozzetto himself (in Italian, with English subtitles), but there are also clips with Maurizio Nichetti as well as excerpts from his animation both in short films and advertising. It's very much worthwhile and provides some insight into his working habits. I didn't see a date, but it must be fairly recent since he talks about his enjoyment of Flash animation as it allows him to create films all by himself again, just as when he started out decades ago. Ten shorts by Bozzetto, totalling nearly an hour (57m:05s), make up the balance of the disc. These often center on insects and their different perception of the world (echoed in the Vivaldi sequence of the main feature). They vary in quality but are never less than entertaining. The last of them, Mister Tao in particular is highly amusing while making a valid theological point. The shorts often have sociopolitical commentary included, yet are universal in tone and not tied to Italian life in any significant way. Phil Hall also contributes some insubstantial liner notes. Call it Fantasia 1.5 if you like. This affectionate Italian parody goes places that Disney would never dare to go, and is much the richer for it. A first-rate set of classical pieces makes it even more enjoyable. The transfer is a bit disappointing, but the extras are both copious and excellent.